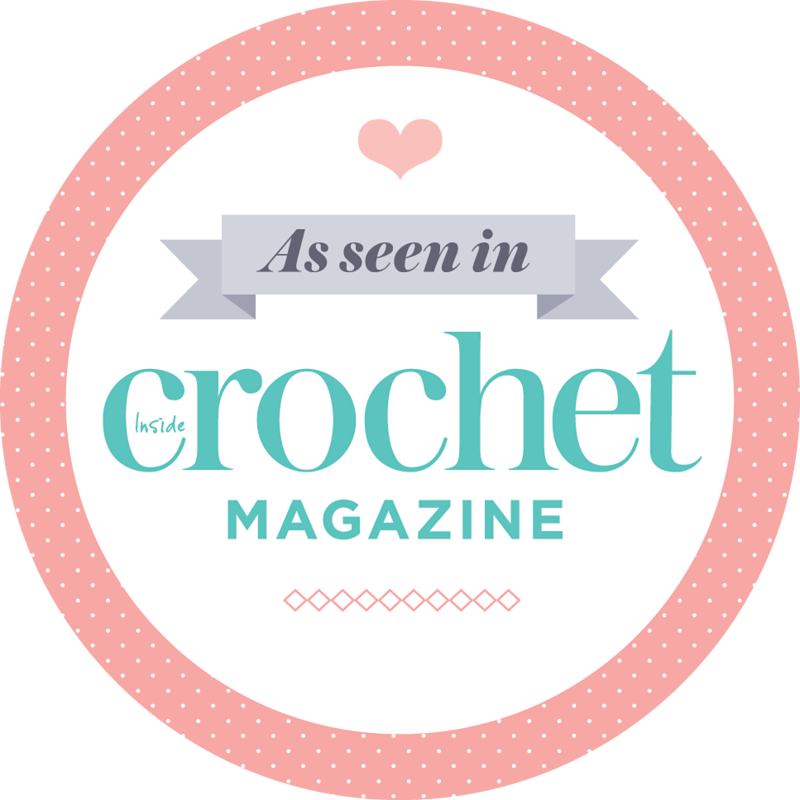 I can’t tell you how excited I felt last week about getting together with one of my crafty friends to do some making, rather than go to another craft event to see others’ creations, or buy more pretties which sit and wait to be used. I set up the dining room into a sewing paradise, stocked the fridge with ingredients for a late breakfast and chilled the wine in case we wanted a post-sewing reward. 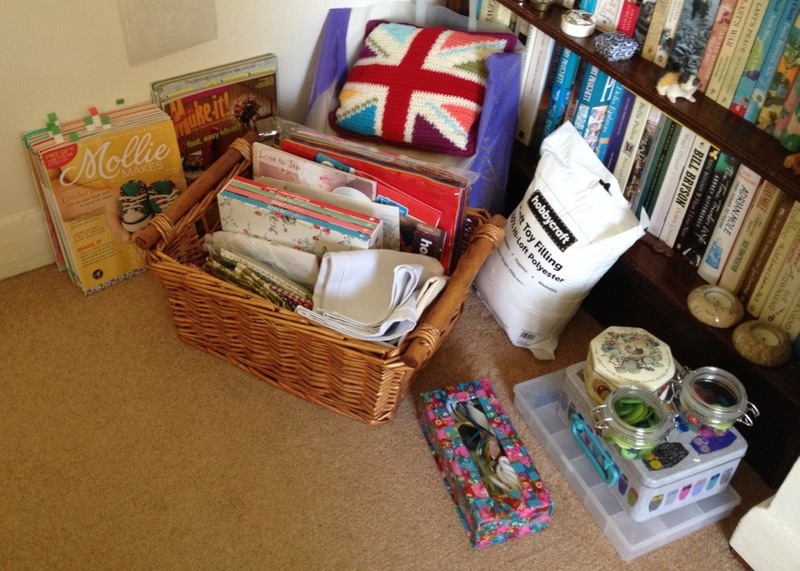 I’ve been saving the Mollie Makes kits for a while now for a social crafting session. 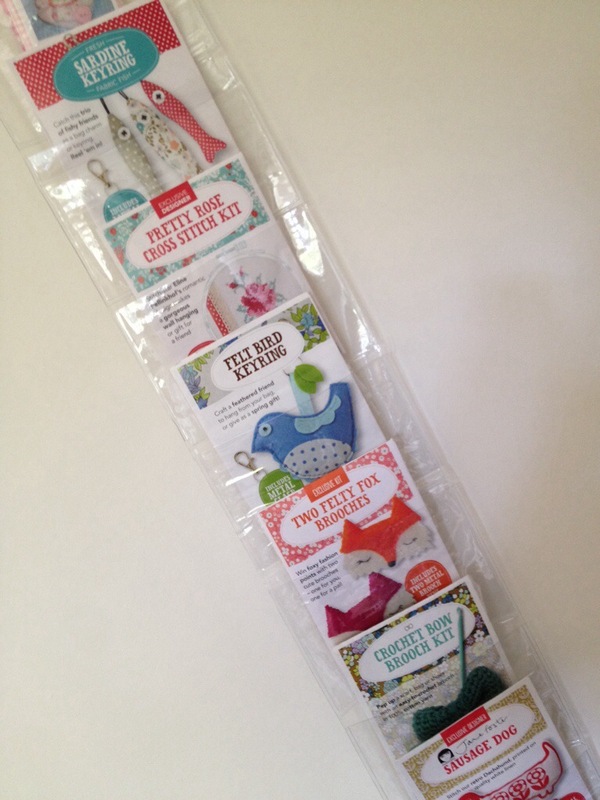 My cousin gave me this craft pocket wall organiser, doesn’t it work well? She’s arrived! We did a happy dance on the doorstep, then I carried in her kit as she unloaded the car. 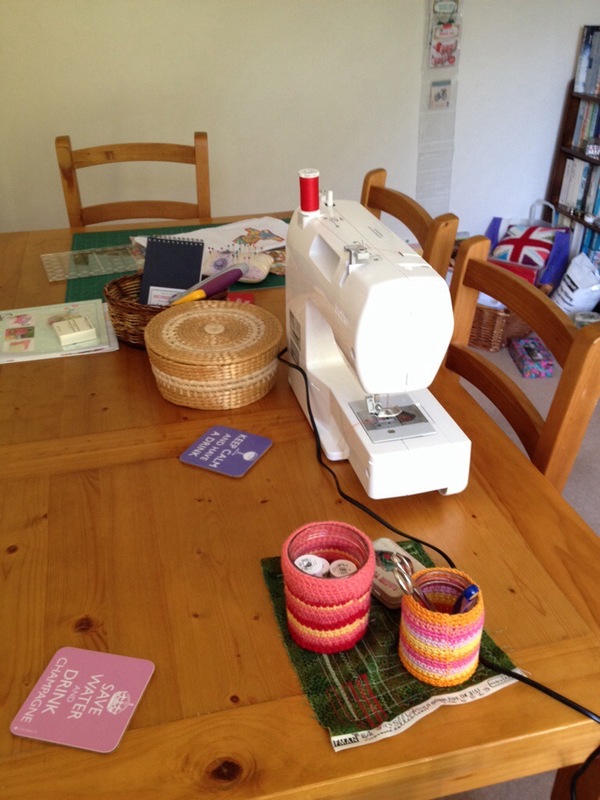 And yes – I know her swanky sewing machine is backwards! 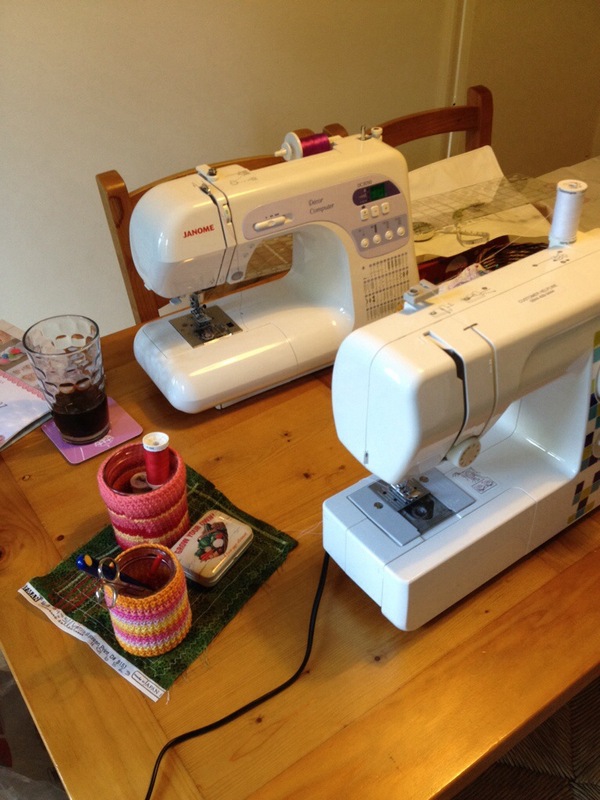 We’re new to sewing, or refreshing our long-lost skills, but not that daft. It was where it landed when I plonked it down with the cover still on. The first thing I said was that I’m not very impressed that Brother don’t sell a cover or case for the sewing machine. It’s going to get dusty in no time, and I don’t want to lift it in and out of the box between use. And so my friend suggested that was exactly what we should make, especially as she happened to have pieces of PVC. What a good idea! 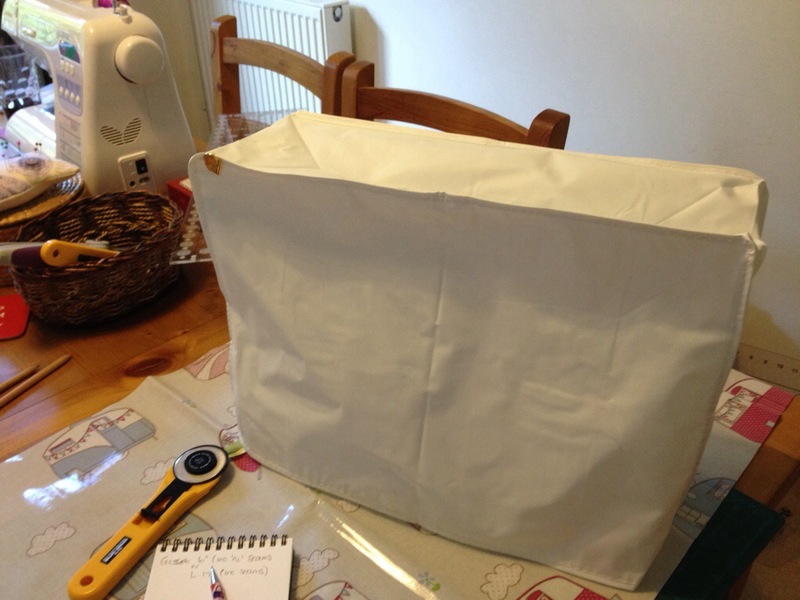 Plus it’s a total money saver as the s/m bags I’ve seen are hardly cheap. 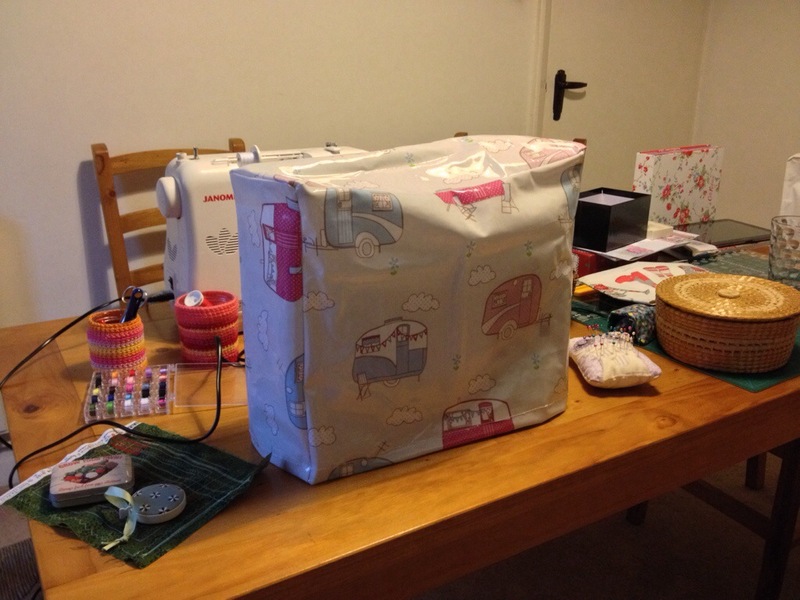 I had imagined we’d tackle one of the easier projects from Sew! 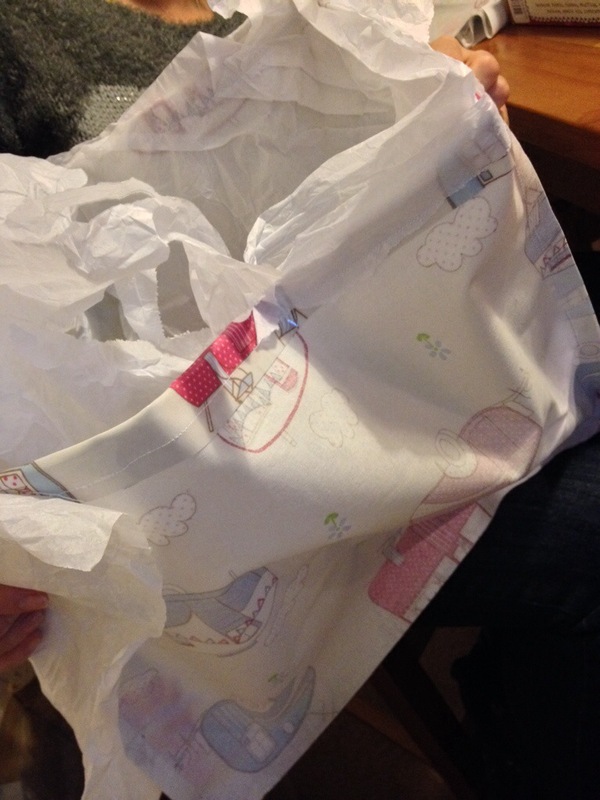 part of my collection of Cath Kidson books but no, we basically made a sewing machine cover from scratch – no pattern! If you’re a sewer (do we have to use ‘sewist’? Where did it come from – is this an American term?) you might be quite unimpressed with this but we’re both fairly inexperienced. When I tried to hem the bottom of the nearly completed cover we just couldn’t get either machine to go. The PVC surface was too grippy and held tight. After a bit of head scratching I remembered reading how you can use tissue, or a special tear-able material to sew with flimsy fabric for support and improved tension, I imagine. 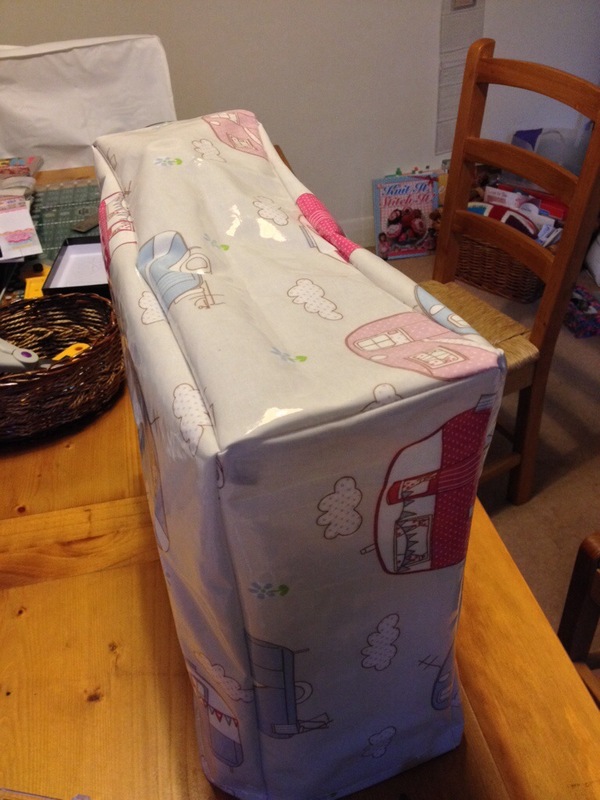 Something tissue wrapped arrived last week and I’d tucked it away Womble-like ….. “making good use of the things that we find, things that the everyday folks leave behind”….. The drawback was that in order to get the machine to move the tissue had to be at the front and back of the cover. Ha ha! 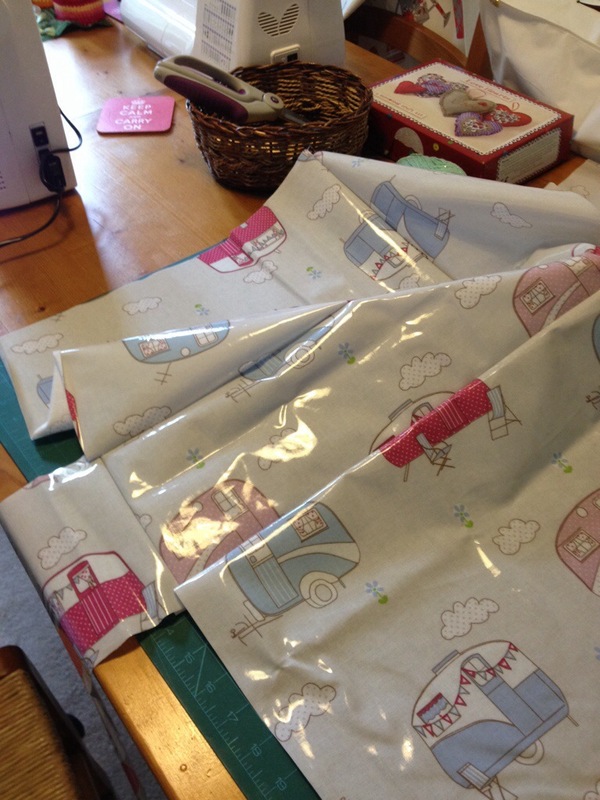 I’m not only sewing a new material, on a brand new machine, but I’m sewing blind. It’s a bit wobblier than my other pretty even seams, but if you visit and check the straightness of the stitches at the bottom of my cover you just won’t be invited back again. Ripping the tissue off was actually good fun – a bit like when you’re tiny and the wrapping’s not to be admired, it’s all about the present. Of course now I need to look out for more tissue to hoard. This is immediately post ripping so I can see little white lumps of tissue under the stitches in this photo. Afterwards I wiped both inside and outside with a damp cloth and it all came off. but you can if you want to ;-) I just did a practice run to check this vid and heard howling noises coming up the stairs. Soup for dinner tonight it is, despite the earlier look of depression. That’s what you get for mocking my Dolly. Ps: for my machine ( I have a Janome) you can buy a special foot to work with materials that doesn’t slip like PVC, plastic, vinyl etc). It’s very easy to change and not very expensive. Ahhhh now that’s interesting. Thanks Taciana. We will have to file that info away for the future! Ooooo, ooooo wish I was there! I was getting all excited at your sewer’s (nothing at all to do with drains) paradise photos. Beautiful cover, especially like the PVC with its cute caravans. Mine’s a Brother too and only has a flimsy PVC cover (which never gets used!). I should follow your good example…. if I’m ever allowed near the sewing machine again. You’ll get there again. If not sneak off to the train at dawn and come here to sew! Great job, you must be very talented. OMG it looks better every time I see it. High five! 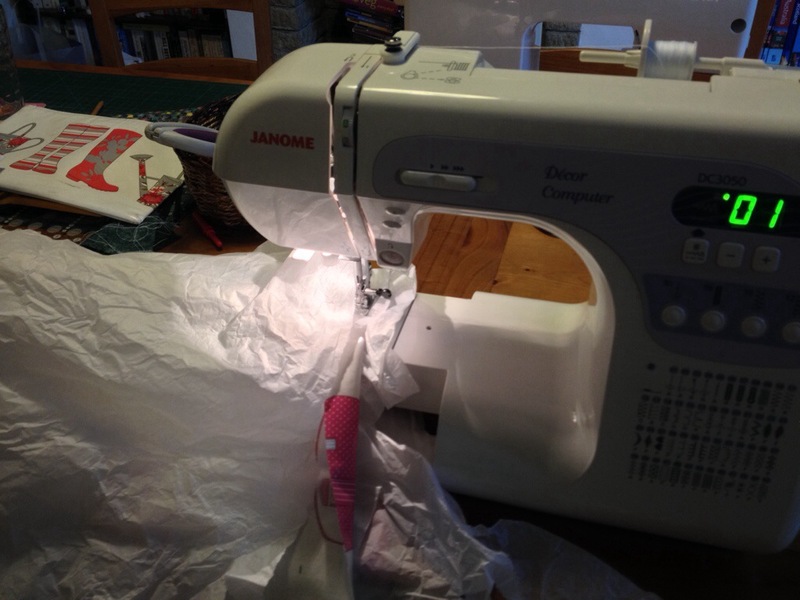 You’re a natural – And it’s a brilliant idea, I’ve just looked at my sewing machine cover and it’s gone all moldy on top! Perhaps there’s a gap in the market there? Richter and well done re tissue and scary sewing machine- how about Seamstress?